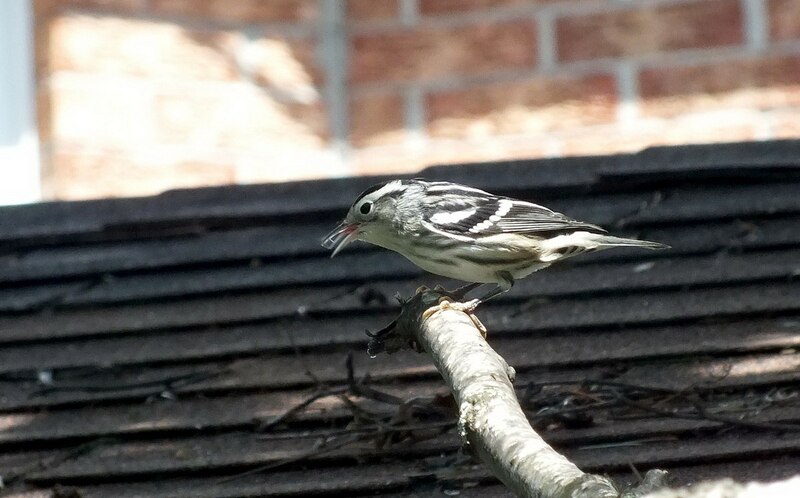 My husband, Bob, while in the process of putting bird food into the feeders, happened to notice a new visitor to our backyard…a Black-and-White Warbler (Mniotilta varia), a type of Wood Warbler. 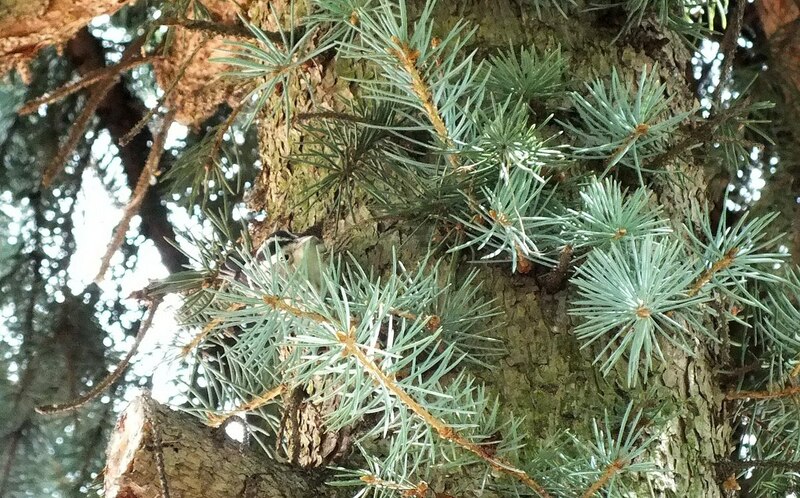 With camera in hand, I had a hard time locating the little bird on the trunk of our neighbour’s spruce tree as it was foraging for insects in behind some short sprouts of new growth. 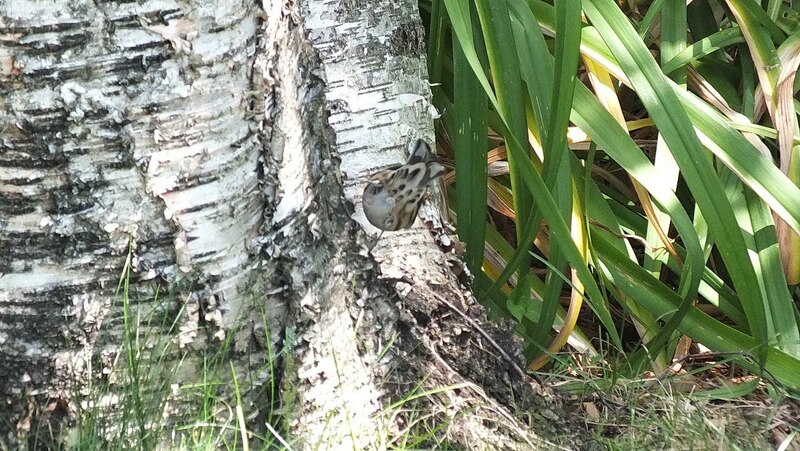 The warbler moved quite quickly from one location to another, searching for tidbits in our birch trees, amongst the branches of our apple trees, and in crevices of our fence. It behaved, for all the world, like a nuthatch in its movements and foraging efforts, creeping up and down the tree trunks, hence its old name, Black-and-white Creeper. 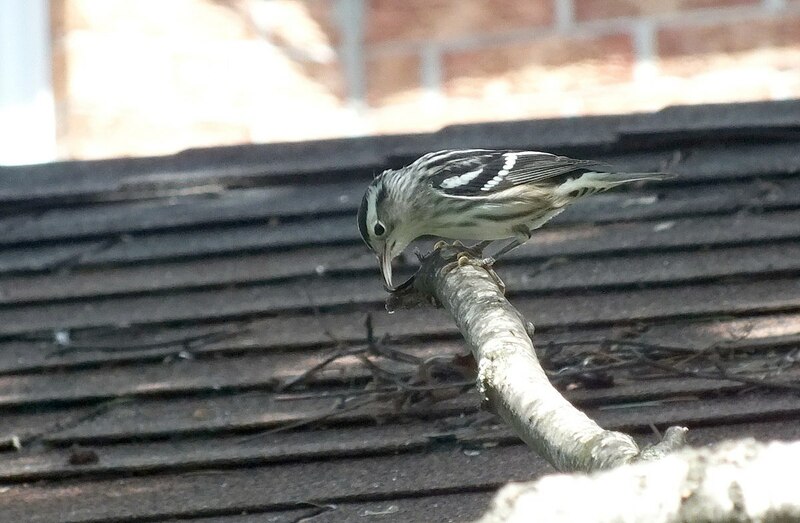 No other warblers creep along tree trunks and branches in search of food, but the distinctive white stripe down the middle of the black crown is a definitive way of distinguishing this bird from other black-and-white warblers such as the Black-throated Grey and Blackpoll. As the warbler crept round the base of the birch tree, it afforded an excellent view of the delicate colouring on the underside of the tail and abdomen. 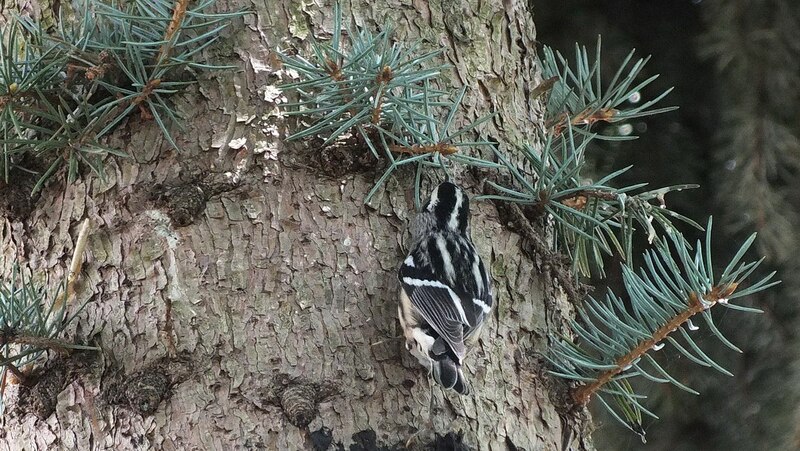 It certainly aids its camouflage on the black and white bark of the tree. 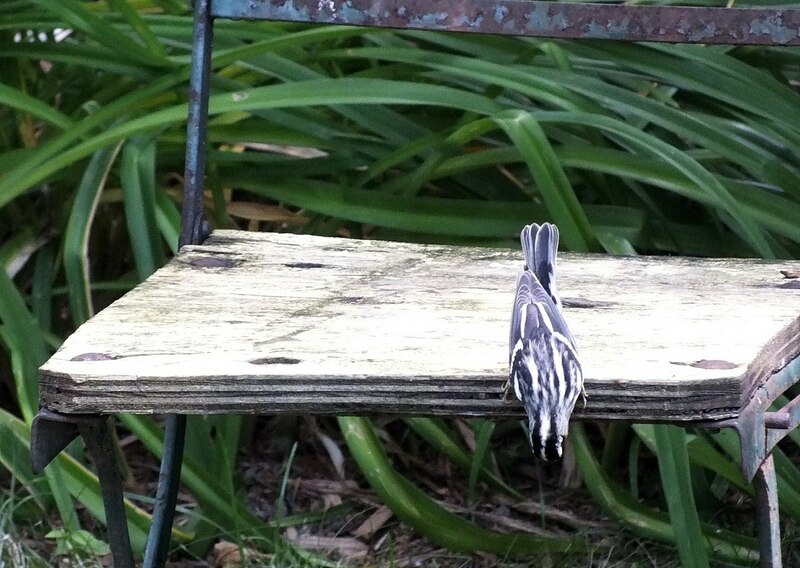 The Black-and-white Warbler seemed to recognize an old chair in my garden as the piece of garden art that it is given the network of cobwebs glistening in the sun. Perhaps it snatched up some insect before it became ensnared in the sticky web. 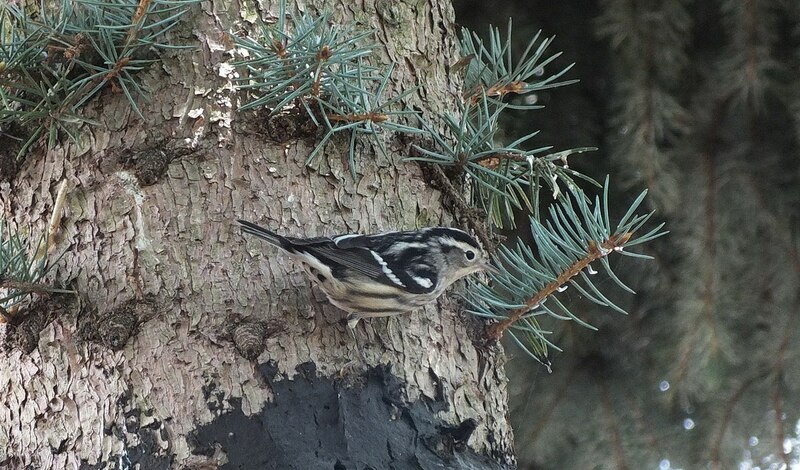 I believe this Black-and-white Warbler is an adult female given that the white sides show signs of buff-coloured feathers. A male would be more boldly striped above and below, except for the plain white belly. 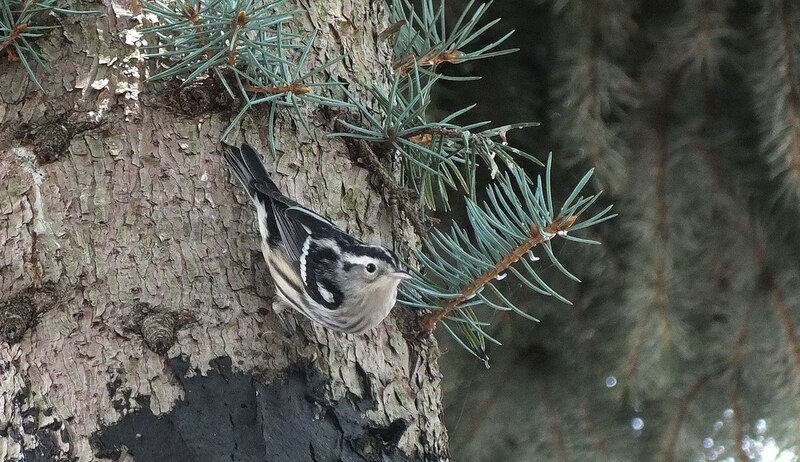 The Black-and-white Warbler is the only member of the genus Mniotilta, which means “moss plucking”. On each of their feet, these warblers have an unusually long hind toe and claw that enables them to move securely on the surface of tree bark. We were graced with the presence of this small warbler in our garden for close to a half hour, and it didn’t seem at all to mind the hubbub of activity going on in neighbouring yards. I’m sure from Toronto, it will be making its way south, but I wonder just how far it will have to travel. 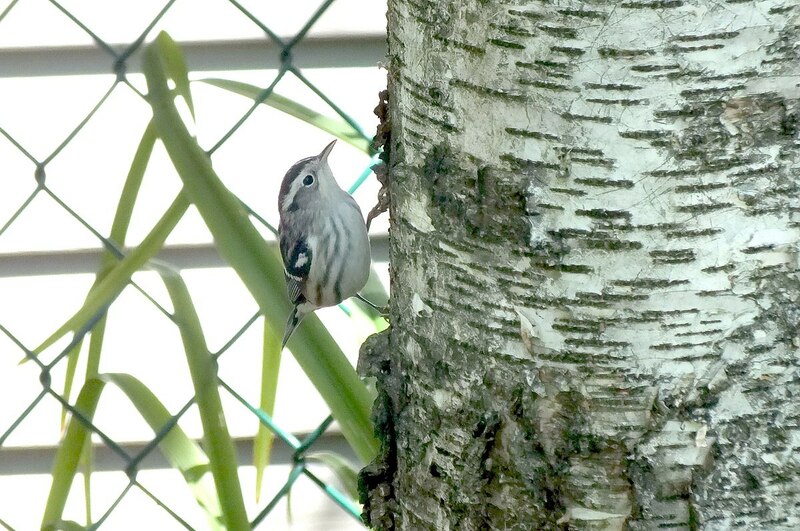 Black-and-white Warblers winter anywhere between northern Mexico to as far south as Northern Venezuela and Colombia. Travel safe little one!